The PickForce Moving & Storage Solution, have been storing home furniture, commercial goods and a comprehensive variety of valuables for our clients. We specialise in Managed Storage, that means that we do all the work for you, our client. Every customer has their own self contained & fully secured storage unit, accessible at anytime during our normal business hours. We know that many clients are too busy or maybe just unwilling to use a self-storage unit. Hiring a Van & then physically moving heavy or fragile items is just too much stress for many people. Our Managed Storage service is designed to make your life a lot easier. 6 bedroom house, or perhaps the goods or contents of a large business or office premises, we have a range of different sized secure units that will keep all your possessions completely safe, and always ready for their return. Our storage facilities are clean, dry and fully secured by separate levels of security. 24 hour on site security, 365 days per year provides complete around the clock protection. Randomly timed security guard patrols 24/7. CCTV + Fully alarmed perimeter beaming around the complex. All site visitors must report on arrival at Security Barrier & provide �authority to access� ID. 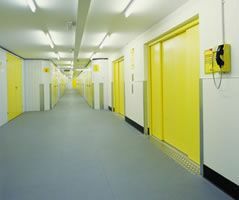 Individual lockable Units, each linked to the central alarm and the security office. For commercial clients, who know they always need storage space to be immediately available, to meet instant demands, for example ideal for Distribution Services or Housing Associations. NO Hidden Charges � Our Terms are fair, tested & approved & meet the best Industry Standards. We provide a quotation, so that all the costs are agreed with you in advance. You declare the value of the goods to be moved or stored, and we provide the requested Insurance Cover. We also provide a written inventory of all your items stored & we are always available to add, remove, collect or deliver any items, whenever you authorise a request for our �Immediate Action� services. No paying for storage you don�t need.